It is the perfect summer lunch. (you) (only) (to need) (some) (fruit), (enough) (liquid), (and) (a bit) (ice pieces). You only need some fruit, enough liquid, and a bit of ice. There is no one way to do it. (wo3) (xi3 huan1) (yong4) (cao3 mei2), (lan2 mei2), (huo4) (tao2 zi. ), (han4) (duo1 ban4) (zong3 shi4) (ye3) (xiang1 jiao1). (I) (like) (to use) (strawberry), (blueberry), (or) (peach), (and) (usually, likely, big chance) (always) (banana). I like to use strawberries, blueberries, or peaches, and almost always banana. The liquids help it all mix well. (I) (prefer) (one half) (cow milk) (with) (some) (orange juice) (and) (a little) (yogurt). I prefer half to be milk, with some orange juice and a little yogurt. All of this is enhanced by the foods everyone loves to hate. I like to put in a pinch of salt, plus add several spoonfuls of sugar. I never measure anything exactly. Finally, I put some ice cubes in the blender. The ice is not the only frozen thing, though. Most of the time I use frozen fruit. On hot summer days it can be hard to find something appealing to eat. 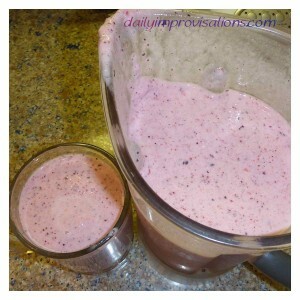 Drinking a fruit smoothie makes one feel cool and comfortable, like a refreshing breeze is blowing. a fruit smoothie isn’t too heavy. 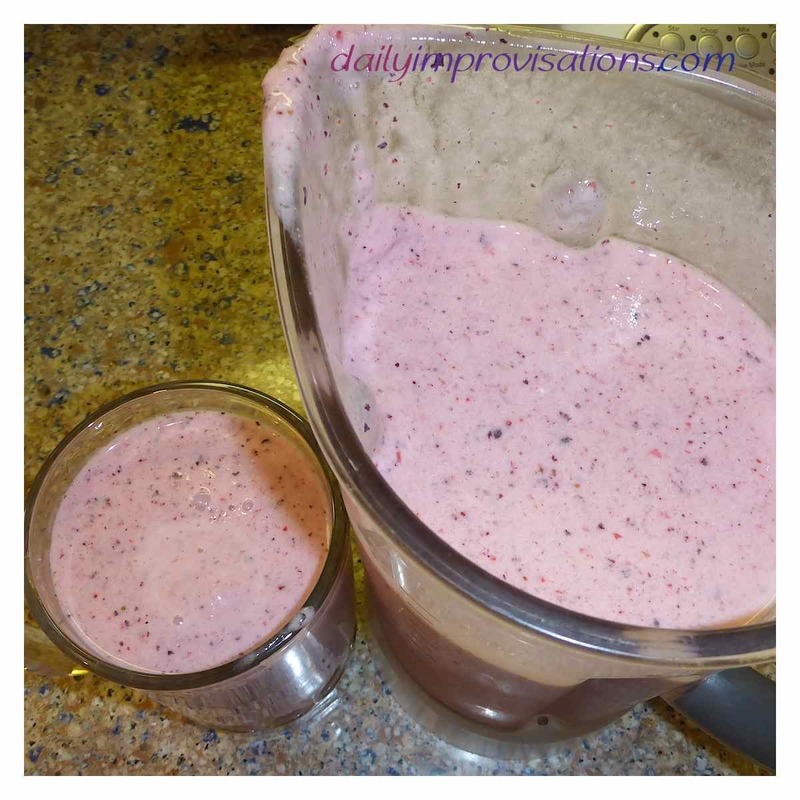 A fruit smoothie is a source of energy, so it is both delicious and nutritious! It is easy to save leftovers, too. I use the same recipe to make popsicles. When my friends visit, they never turn down a serving. 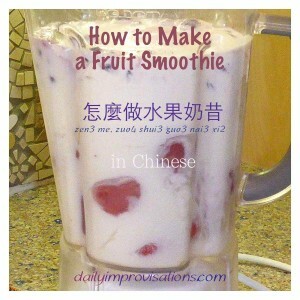 My homemade fruit smoothies are high quality, and also one of the best tastes in the world. ❶ The concept of a “smoothie” is basically the same as a milkshake. The word 冰沙 (bing1 sha1) “ice crushed” (as in sandy gravel or small pebbles) might also be used, emphasizing the use of ice more than milk; or, if it is a “green shake,” it might be called 果菜汁 (guo3 cai4 zhi1) “fruit vegetable juice.” It all depends on the ingredients, 材料 (cai2 liao4) “material stuffs” or 原料 (yuan2 liao4) “original materials” in Chinese. ❷ I find it interesting that by including the character for “water” 水 (shui3) in the word for “fruit” 水果 (shui3 guo3) , the inherent juiciness of fruit is emphasized. ❸ The ubiquitous “adjective marker” 的 (de.) usually needs to be added to the Chinese words even if the dictionary only gives the specific translation of a word without this addition. For instance, when I look up “enough,” only the Chinese translation of 足夠 (zu2 gou4) is given, but the 的 (de.) must be added in the sentence. ❹ The 莓 (mei2) in these two words specifically means “berry.” It is a combination of the Chinese radicals (basic written part of the character) for “plant” and “every,” which makes me think of finding berries “everywhere” on the plant. ❼ In Chinese, there is no plural form of nouns. The number of anything is indicated by the preceding description. ➓ Isn’t that a fun way to say that?! In English, we tend to say something tastes “heavenly,” but in Chinese they are “a little more grounded,” but possibly more poetic by limiting themselves to this phrase. I may have to use it in English more, too, now. “In the realm of mortals” has a nice ring to it. Get your 21 Very Helpful Hints for Learning to Speak Chinese! Sign up for the FLC newsletter and get your 21 Hints, plus access to the FLC private resource page, which includes a beautiful bopomofo chart that helps get Chinese into your head better; and many printable pdf's of what is covered on the blogs to make review and practice easier! Get your 21 Very Helpful Hints here! Learn and practice the Chinese language with a picture book story about a little girl and a blue fish. The book is designed specifically for English speakers who are studying Chinese. Practice Chinese while exploring a rocky beach with two adorable twin girls! 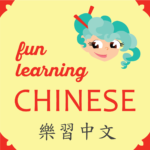 All pictures and content including the name and logo “Fun Learning Chinese” are Copyright (c) 2019 by Laura Blodgett, unless otherwise noted. Please contact the author with any questions or comments. To listen to the podcast on Pocket Casts, click on the image. I'd love to hear from you! Click here to send me a message.